Working with our parent company, Phoenix Stamping Group, we offer a wide range of stamped, fabricated and welded sheet metal products and a growing number of tube and wire rod products in-house. 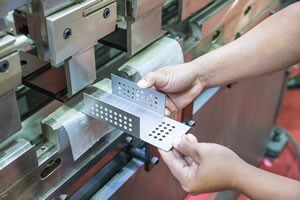 Our extensive partner network rounds out the full range of metal stamping and fabrication solutions from the tiniest spring to the heaviest gauge carbon steel, with solutions including casting, extrusion, forging, heat treatment, hydroforming, welding and finishing processes including powder coating, polishing, plating, silk screening and painting. Our commitment to quality, innovation and service is inherited from our parent company, Phoenix Stamping Group, who has honored these same ideals for nearly 30 years. Learn more about our metal fabrication abilities and expertise. Contact us today to discuss your needs or request a quote.